Merhaba (G'day) & Hosgeldiniz (Welcome) to Selcuk, Ephesus, Turkey. Please click the link to our walk to our Office button to find us from any Hotel/Location in Selcuk. 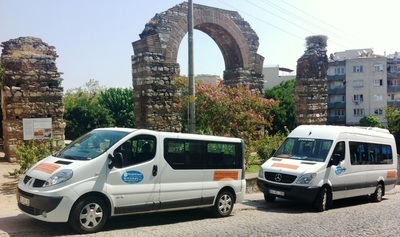 ​We at No Frills Ephesus Tours offer a no nonsense tour experience without substituting on quality or service. Our aim is to provide the visitor to Ephesus a unique cultural based tour experience with a professional English speaking guide, without the hassle of being taken to various factory outlets or shopping stops along the way. If it is the Ancient City of Ephesus and the Ephesus Museum, the Temple of Artemis, St John's Basilica or the house of the Virgin Mary that you have come to see then that is what we aim to show you. 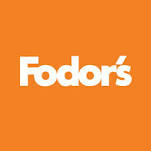 We understand that many holiday makers have limited time and budget. With this in mind we offer "no frills" Ephesus tours at a competitive price. We believe that many people miss out on the tours that they want to do on holiday because of the inconvenience of the many shopping stops along the way. The sights are what you have come to see and that is what we aim to show you. With our professional team of English speaking tour guides and staff our goal is to offer you an unforgettable tour experience of Ephesus. Want something extra that's not included on your tour? Ask us about the various add-ons you can choose from to make your sightseeing experience complete. 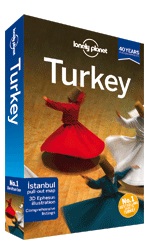 We also have a list of other activities and excursions on offer in and around Ephesus. 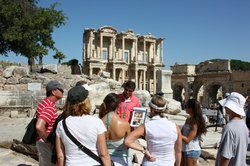 Enjoy your Ephesus Tour - Ephesus Tour Guide stop at the Celsus Library in Selcuk, Ephesus - Who is Tiberius Julius Celsus Polemaeanus? Is your Ephesus tour guide lcensed? Come and join our Tour from Kusadasi with pick up from our ﻿central meeting point﻿ in Kusadasi. Daily Ephesus Tour from Kusadasi. Take a pleasant train journey through the Aegean countryside and join our tour from ﻿Izmir by Train﻿. ​​Ephesus Shore Excursions - Visiting Ephesus on your Cruise Holiday? 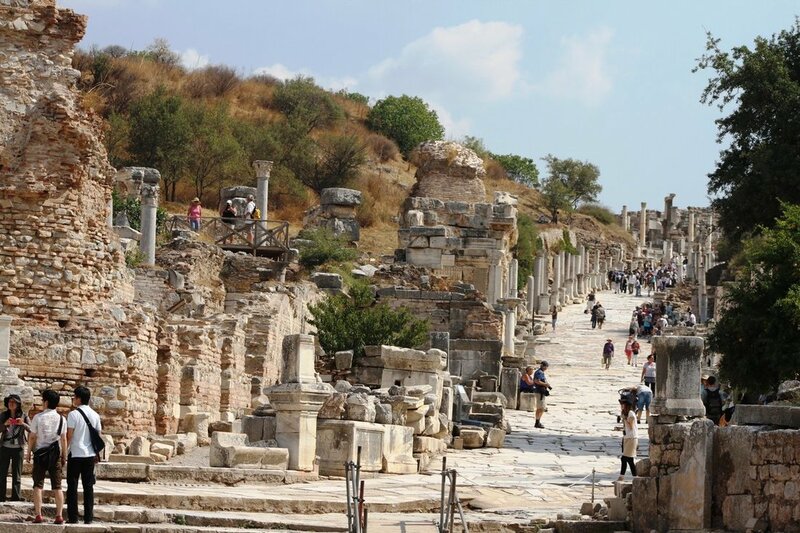 ﻿Visiting Ephesus on your Cruise Holiday? Sailing into the port of Izmir? Have a great private shore excursion tour with a guide to Ephesus at a reasonable price !!! Sailing into the port of Kusadasi? 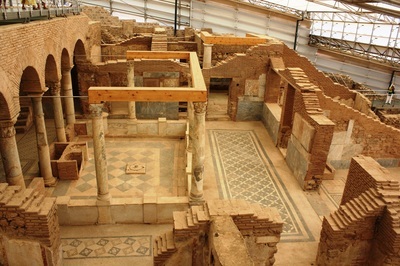 ​Have a great private shore excursion tour with a guide to Ephesus at a reasonable price !!! 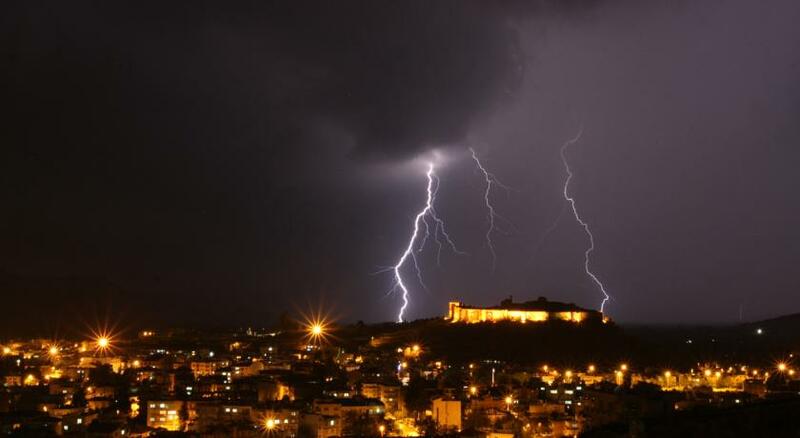 Ephesus Lightning is a sudden electrostatic discharge that occurs typically during a thunderstorm. This discharge occurs between electrically charged regions of a cloud (called intra-cloud lightning or IC), between two clouds (CC lightning), or between a cloud and the ground (CG lightning).